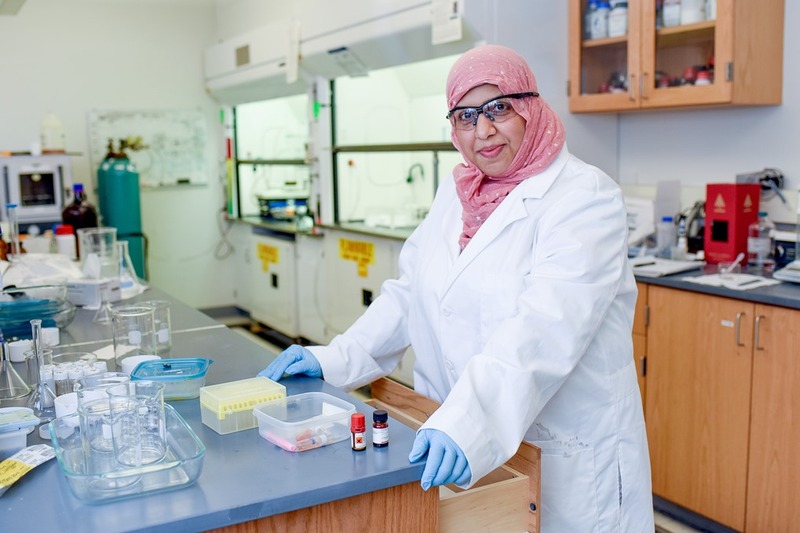 While working on her master’s degree in her home country of Saudi Arabia, Heba Al-Mohsin wanted one thing: the opportunity to do her own research in the laboratory. In the Saudi university that Al-Mohsin attended, lab work was done at a men’s university because the instrumentation wasn’t available at the women’s university. 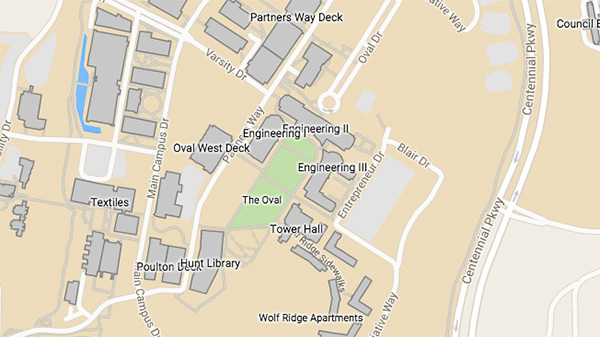 Women students at their own university would analyze the men’s lab data. “This is part of our culture, that men are separate from women. And even though I went to the head of the department, and said ‘I will bring my father or my brother to work with me,’ no one listened to me,” Al-Mohsin said. So she decided to come to the United States for her Ph.D., first to the University of Washington to hone her English skills, then to NC State University to study polymer science with Dr. Richard Spontak, Alumni Distinguished Professor of chemical and biomolecular engineering, and materials science and engineering. In November, Al-Mohsin successfully defended her dissertation and will earn her doctorate at commencement Dec. 18. Her U.S. journey from English student to Ph.D. candidate was full of personal and professional challenges. Far from her home, she and her husband Wajih Abuzaid welcomed the births of two daughters, while managing a five-year separation from family and adjusting to a new culture. After her defense in a room filled with students and faculty, Al-Mohsin breathed a sigh of well-earned relief and shared her story, bringing tears to the eyes of her committee members, according to Spontak. But Al-Mohsin says she thought about giving up on graduate school more than once, and probably would have returned home except for the support of her family and the faculty mentors she couldn’t bear to disappoint. Al-Mohsin was just two days from starting her second semester at NC State when her daughter Zahra was born several weeks premature. Away from her family, she struggled with her new role as a mom and her desire to continue her doctoral work. Spontak stood by her and helped her find a way to continue her program. Her daughter eased into daycare, and things seemed to be back on track. 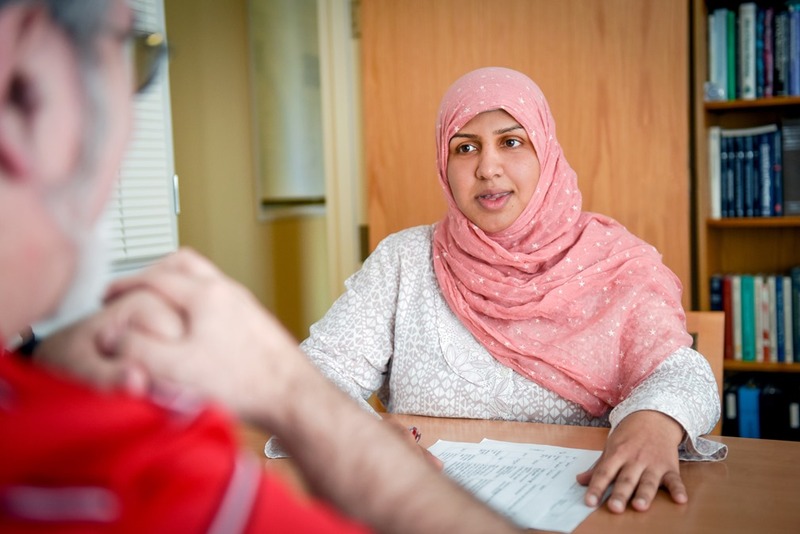 At the end of the next academic year, she began to feel tired and sick after a trip back to Saudi Arabia, and she soon discovered she was pregnant again. She kept the news from her colleagues until after her second daughter Fatima was born. The birth came as such a surprise that one of her colleagues literally fell off his chair upon hearing the news, Spontak recalls. Her research focused on photovoltaic elastomer gels – a novel polymer design that can be used as solar cells. These materials can be recycled and are eco-friendly, and they exhibit robust mechanical properties. And these materials, only available in the past few years, are highly flexible and tough, and possess excellent adhesive properties, making them an excellence choice for solar cell applications. From her graduate research, Al-Mohsin has published four papers and submitted one patent disclosure on the subject. After the birth of daughter Zahra, Al-Mohsin had to make another cultural adjustment – learning to drive, something that women in Saudia Arabia aren’t allowed to do. She took that step in order to avoid bringing baby Zahra out into the winter cold when her husband dropped her off on campus in the mornings. Al-Mohsin said that staying true to her Muslim religion wasn’t difficult at NC State, where she felt very accepted, even when her spiritual practices were at odds with U.S. culture. For example, after declining to attend her lab’s end-of-semester dinners for several years, she finally explained to Spontak that she was uncomfortable dining with others who were consuming alcohol. Without reservation, her professor and colleagues agreed to forego alcohol at dinner so that Al-Mohsin could join them. As a Saudi national studying abroad, Al-Mohsin and her family received tremendous support from her home country, which paid her tuition, living expenses and health insurance. And her husband Wajih Abuzaid also supported her doctoral education by running the home while Al-Mohsin worked. 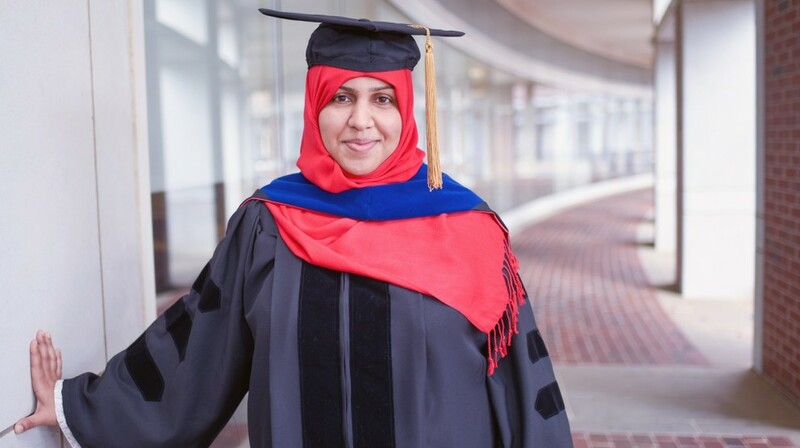 After commencement, Al-Mohsin and her family will return to Saudi Arabia where she will be a postdoctoral scholar at the King Abdullah University of Science and Technology (KAUST) in Jeddah – the only university in the country for both women and men. Eventually, she would like to create a community of women scholars in academic research. She credits El-Shafei, her professor, with introducing her to Dr. Aram Amassian, the professor with whom she will work at KAUST. She had read about Amassian’s work and was planning to contact him, when she learned that he was coming to NC State. El-Shafei had already planned to meet with him, and he invited Al-Mohsin to join them. “It was really like a dream. When Dr. Amassian came and I had this chance to talk with him, I was so happy. It’s a good chance for me to continue my research, but inside my home country,” she said. To help jumpstart her dissertation writing, Al-Mohsin participated in the Graduate School’s Dissertation Institute last spring. She said it helped her understand how to organize her thoughts into a cohesive paper. Al-Mohsin knows she will miss much that she has experienced in Raleigh, especially the opportunities for her daughters, now ages 5 and 2 ½ – museums, libraries and more. But she is sure that being closer to her family will mean a great deal. In addition, her husband’s parents are getting older and want him to live nearby. I congratulate Ms Heba Al-Mohsin for successfully completing her PhD. This is a real story which is the living truth of the fact that obstacles or adversities will always come along but if one decides to keep moving ahead towards the final goal, howsoever hard it gets, success will come. My best wishes and thank you for sharing this. You have motivated me beyond any imagination and I have no other choice but to keep on trying until I succeed as a mother and student myself. Thank you and all the best as you move back to your home country of Saudi Arabia. Congratulations! best of wishes to you…. I would like to provide an e-introduction for Heba Al-Mohsin to Shilpa Sivashankar. Shilpa is currently a postdoc at KAUST and will be joining NC State BME for a postdoctoral position in September. I think these ladies could help each other adjusting to their new jobs. Please pass this information on to Heba; she is welcome to contact me if she would like Shilpa’s email address. What an inspiring story! All the best! I am encouraged by the story of Heba Al-Moshin. I will not give up too.